I hope everyone had a wonderful holiday break. 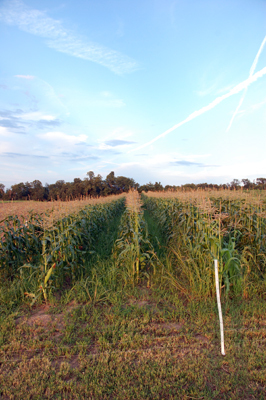 Sweet corn is the last of the last – many ears are smaller and may have worms at the tips. Please cut off the top 1/3 of the ear before husking. Eat the cantaloupe straight away as they are ripe and sweet now – orange honeydew and watermelon will follow. Lettuce is iceberg or romaine – enjoy salads while you can. Two more weeks of red potatoes before moving into the Cascade white baking potatoes. Last of the fennel, one more week of cucumbers and summer squashes. Winter squash delivery season begins next week with acorn! Marjoram or oregano is great with potatoes, squash, or carrots. Peppers, peppers, and more peppers – lots of varieties from sweet to heat. You can use them up, roast and freeze, freeze as is, or dehydrate and freeze. We received 3.5 inches of rain in the last 48 hours. I will be in the Boundary Waters all next week. Please be patient with our farm interns as they manage the farm in my absence. Wash all of our produce before you use it. I hope all of you had an enjoyable summer and a relaxing and memorable Labor Day weekend! And I hope that most of you got away from your daily routine and responsibilities sometime this summer to explore and soak in new experiences and places. Growing up in a family of thirteen on the farm we seldom, if ever, took a family vacation off the farm. Vacation was ‘summer vacation’ from school, and any time away from the farm was for a reunion, a family wedding, or to visit a sibling. And those cows needed to be milked 2 times a day, every day! As an adult, a husband, and a father, I had to learn that time away from school or work was good for the soul, good for relationships – helped to create a more balanced life! 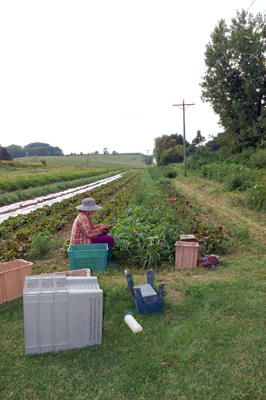 I have not taken a week off during the CSA season in the last 14 years, although I have enjoyed some long weekends and down time during the winter months. This Sunday Diane and I are going to Duluth/North Shore/Boundary Waters for 8 days and I can’t wait!! I am blessed to have some very dedicated, hard working and intelligent interns and I know that the farm/business will be in good hands while I am gone. 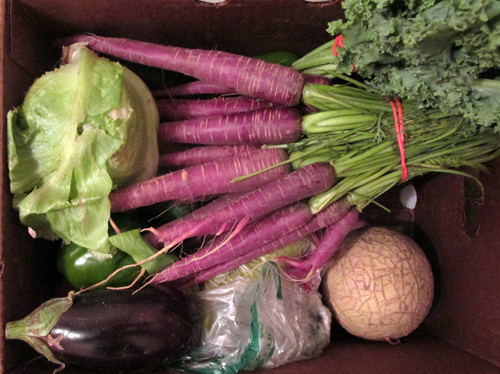 There may be a hiccup or two along the way, but you should have your box delivered on time, filled with yummy produce like always. I am certain that I will come back with more enthusiasm than ever to continue doing this work that I love. There are hundreds of varieties of melons, though only a select few have achieved widespread popularity as a sweet addition to a late summer meal or snack. 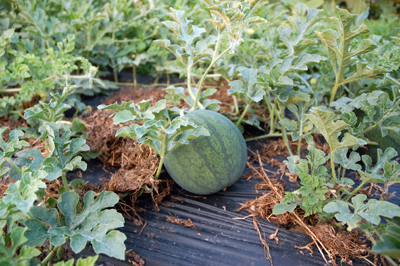 The most popular melons – and the ones we grow here at Earth Dance – are cantaloupe, honeydew, and watermelon. Originally from Northeast Africa and the Middle East, the melon fruit is actually a type of berry that dates back to the Bronze Age. Spanish settlers introduced the melon to the Americas, where new cultivars were developed over the last few centuries. The North American cantaloupe is recognizable by the net-like patterning on its skin. Known also as the “muskmelon” due to its distinctive aroma, the cantaloupe has a sweet orange flesh that is normally enjoyed fresh, often in a salad, a dessert with ice cream or custard, or by itself. With a much smoother skin than its cantaloupe cousin, the honeydew melon is best known for its pale green flesh (though ours is actually orange). Like the cantaloupe, the honeydew is a member of the Cucumis genus of the gourd family, defined by its twining, tendril-bearing plants. It may come as a surprise that this genus also includes the cucumber, though anyone who has grown the two will likely be able to spot the similarities. Unlike the cantaloupe and honeydew, the watermelon can be found in the Citrullus genus of desert vines. Watermelons are typically associated with their large size (sometimes weighing up to 200 pounds!) and their bright red flesh, though the cultivar we grow at Earth Dance – the “sugar baby” – is much smaller, weighing in at about 10 pounds. These watermelons have a tough, almost black rind that is especially resistant to cracking. They are very sweet and have plenty of antioxidants, making them a very nutritious treat! Preheat oven to 425 degrees. Line 2 baking sheets with aluminum foil and grease with cooking spray. Arrange eggplant slices on baking sheets and brush with olive oil. Roast for 20 to 25 minutes, flipping halfway through. Remove from oven and set aside. In a medium-size bowl, combine ricotta, eggs, 1/2 cup mozzarella, 1/2 cup Parmesan, 1/2 teaspoon garlic powder, 1/2 teaspoon salt, 1/4 teaspoon thyme, and 1/4 teaspoon black pepper. Stir until well combined, then set aside. To make the sauce, heat olive oil in a medium-size pot over medium heat. Add onions and saute for about 3 minutes, until softened. Add garlic and cook for about 20 seconds, until fragrant. Add remaining 1/2 teaspoon thyme, 1/4 teaspoon garlic powder, 1/4 teaspoon salt, 1/4 teaspoon black pepper, parsley, bay leaf, red pepper flakes, and tomato paste. Stir until well combined and let cook for 1 minute. Using a sharp knife, break up tomatoes while still in can. Add to pot and break up further. Add sugar and stir to combine. Bring heat to a low simmer and cook down for 2- minutes, until thickened. Taste and add additional salt, pepper, spices, or sugar if desired. Turn off heat and set aside. Adjust oven temperature to 375 degrees. Spoon a ladleful of sauce onto the bottom of a 9x13 baking dish. Place a layer of eggplant slices on top of the sauce, then a layer of tomato slices on top of the eggplant. Dollop the ricotta mixture over the tomatoes an using a spatula, spread in an even layer. Sprinkle 1/4 cup mozzarella over the ricotta mixture, then 1 tablespoon basil. Continue layering in the following order: eggplant, tomatoes, sauce, ricotta, mozzarella, basil for 3 layers, reserving some basil for garnish. Once you lay the last row of eggplant slices, top only with sauce, remaining 3/4 cup mozzarella and remaining 1/4 cup Parmesan. Cover baking dish with loosely tented aluminum foil, place on baking sheet and bake for 30 minutes.